Great marketing which the product comes no where close to matching - no significant improvement on a 200mg caffeine tablet. I really don't see what all the hype is about...I was really looking forward to trying this after reading all the reviews. I don't feel any thermo effect, no loss of appetite, no increase in energy and haven't notice any change in fat loss etc was hoping this was going to be a great new product for me but I think I will go back to Ripped Freak. Thanks to John @ Xplosiv for the thrifty container!!! Mad feels / Exciting ingredients / 60 caps / made from a great company that put thought into their products. Would recommend this everyday...maybe the pineapple flavour imho. Check out the long review! Energy: Starting off at 1 cap am upon wake up did the trick for the first week and a half which i was very impressed about considering im stim junkie. 20 mins after downing my cap I felt very alert and not jittery at all. Mood/Focus: Mood was off the charts in a good way. These pills made you feel good for hours, helped with focusing at work and helped accomplished my set tasks but without the usual "cant be bothered" attitude. Taking my second pill pre workout coupled with a pwo powder helped me smashed my workouts and actually helped me to break 3 prs on Deadlifts, Squats and DB press. Appetite Suppression: Didn't really feel it tbh, however the mood aspect of this product definitely helped me to avoid cravings that were almost non existent. All in all this is better than the powder version and the closest thing to the old detonate that ive come across. After a week and a half my body got used to the stims so I upped my dosage to 2 caps upon wake up and the effects of them lasted until the completion of the bottle. Got given a couple of caps to try from the awesome dudes at Xplosiv Supplements. Everyone has been raving about this lately, and ANS Performance always hit the mark with their products. The first cap I tried actually gave me a little bit of a tummy ache, I think because I didnt take it with very much water. I tried the second cap a few days later with a bit more fluid and had no problems. Appetite suppression is strong with this one. Once it kicks in, eating and hunger is the last thing on your mind. For me this lasted around three hours, just for a single cap. Decent. I've found that this also gives a real clean feeling of focus and energy, which is awesome. Yet another winner from ANS!! Nothing much to report here just another mean as supplement from ANS. If you don't know the science behind things visit their page there's always a good reason why you should be taking their products. Seriously though these are pretty awesome, have given out a bunch round the gym and so far everyones has the same response to it, no negative feed back to report! 3 Days in and can confirm feels, thermo and appetite suppression. As ever, the feels benchmark is the once was mighty (no longer available) Detonate. Detonate was my first supplement, and blew my head off, loved it, as did 99% of people that tried it (75% of statistics are made up...). The fact that Infernos feels are, in my opinion, close to Detonate, when Ive been hitting the stims pretty hard for months now really says something in my opinion. Unlike Detonate, and many other similar products I have tried, I don't get any edgy feeling, its a more subtle, clean effect. This type of product seems to effect different people in different ways, so it will be interesting to see what the masses think. For me its a keeper and I highly recommend. 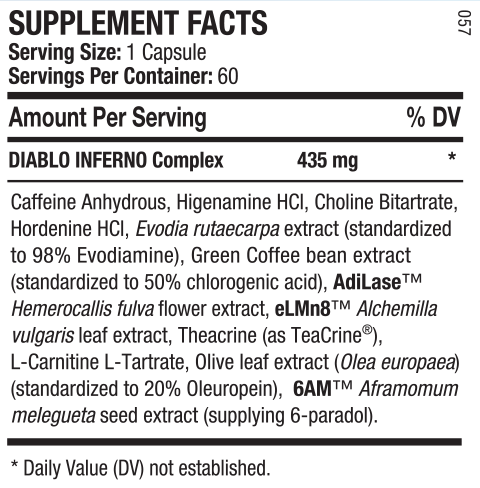 Been using ANS Diablo Inferno for 3 days now and while I cant comment on the fat loss results yet, I can tell you the feels are right there on this one. Strong thermogenic feel on just 1 capsule that hits hard with an immediate warmth that hits you within 15minutes (on an empty stomach). Appetite suppressant properties are also very strong and its easy to forget to eat when using this product. The energy from Inferno is also very good - it's clean too which means no jitters. And long lasting, a single cap seems to affect me for a good 4 to 6 hours which is pretty impressive vs other fat burners I have used in the past and that I probably wont be using again as they just dont compare to Inferno. Oh and focus, cant forget the focus... actually used Inferno for golf today and my game was A1....putting it down to the mental alertness and added focus to my game from Inferno. Overall its a very impressive product and I can see it being very very effective at assisting with fat loss when on a calorie deficit. NB - Its a pill so no flavour. Diablo Inferno takes the energy and thermogenic inducing components of the original powder and tunes them up into a concentrated 1 capsule dose that's all you need. Expect high energy, long-lasting laser focus, appetite suppression and get ready to feel the heat. 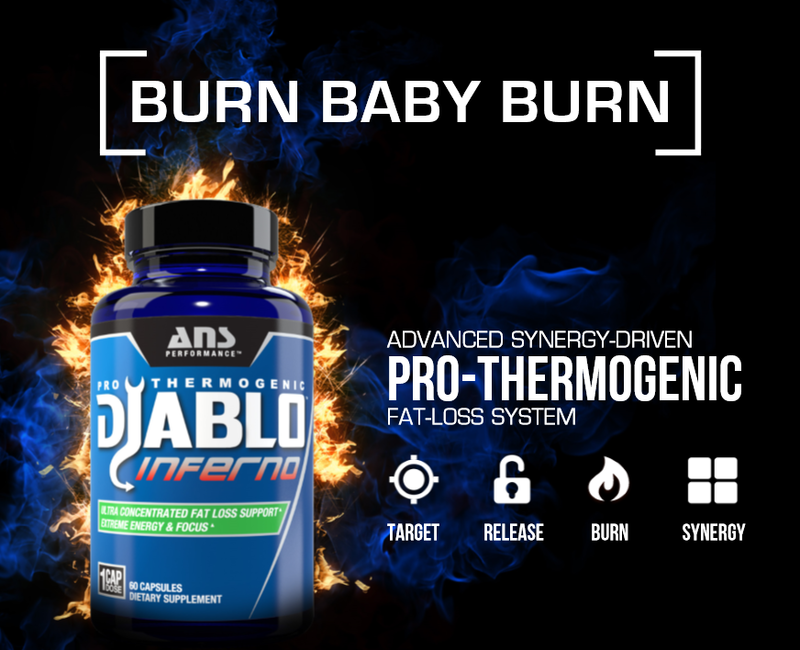 The convenience of a capsule and interchangeable effects of the powder make Diablo Inferno a powerful fat loss product. The addition of Theacrine to the formula increases mental focus and extends the energy far beyond other products, while sustaining the thermogenic feels with no crash. The Diablo family has an awesome new addition...you'll love it. Popped my first Inferno today as i wanted to wait until I was fully fasted with no traces of caffeine left in my system. Being a regular (everyday) user of Diablo, I was pretty keen to see how this compared, and I was not disappointed. Took around 40 minutes for it to hit me, and when it did it was almost a euphoric feeling. My alertness was through the roof, energy levels were insane (i was literally running around), appetite was gone, and those thermogenic feels were right there in my belly. . Stressful environment at work but I was 100% making it. You can't fault this product, Honestly.. It was a while being made and so much hype behind it.. Popped my First capsule in the afternoon and had been hungry as I left my lunch at home, within 30 mins I wasn't hungry anymore and starting sweating and felt great despite only having 2 hours of sleep the night before.. In terms of appetite suppression clean energy (Good Vibes) I think they've nailed it.